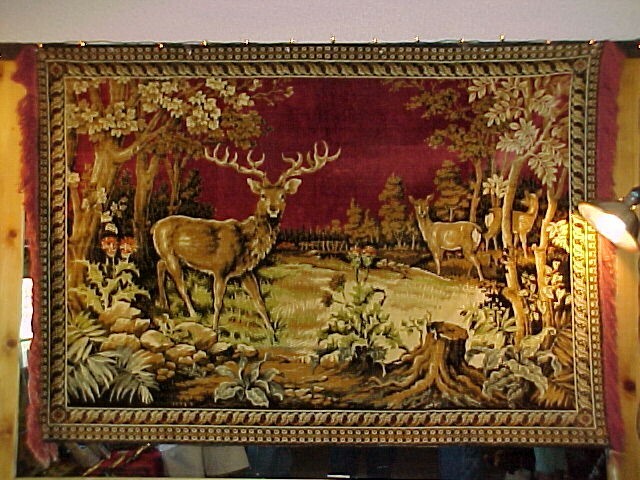 This beautiful Elk Tapestry Wall Hanger is approximately 5'X 7' and is quite dynamic for a cabin/lodge or Western room. In good condition. EMAIL FOR OTHER CHOICES / PICTURES CAN BE SENT: HORESES, SPANISH DANCERS, BEARS, ELK, ETC 1920s---40s Please email cowboyron@cowboycabin.com with questions or call 406 270-2842.